This is not the first time that I have pointed out the perfidy of Republicans in United States government as it relates to birds or conservation. 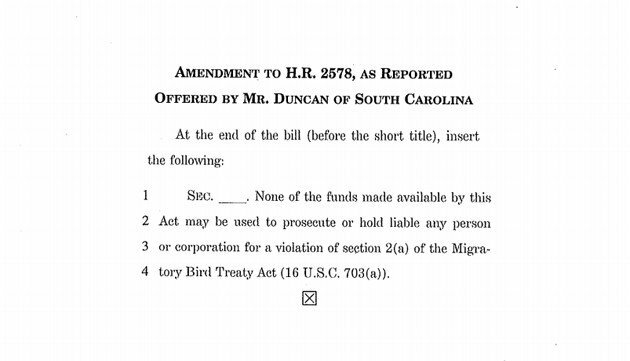 But this attempt by Congressmen Duncan of South Carolina to completely prevent any enforcement of the Migratory Bird Treaty Act is beyond the pale, even for bird-hating Republicans. So, naturally, it is also the perfect time for Congressional Republicans to completely suspend one of the main laws protecting [birds]. First passed in 1918, the Migratory Bird Treaty Act is one of America’s original conservation laws. It protects familiar visitors like cardinals and chickadees; raptors such as bald eagles and prairie falcons, and, of course, the many ducks and other waterfowl that sportsmen treasure. …Yep, forget the Migratory Bird Treaty Act (without the possibility of enforcement, laws don’t mean much, do they?). If Representative Duncan gets his way it’s open season for birds across the country. Because, really, who needs hummingbirds or eagles? I’ve said it before and I’ll say it again. If you are a birder you can’t justify voting Republican. You just can’t. You should turn your binoculars in and take up a hobby that fits better with your politics. You know, like pulling the legs off of flies? Not sure why you feel having this Cory character rant on like this improves your site. Evidently he takes pretty photographs and I am sure his two cats are just as sweet as mine, but hatred never displays well. How is posting information about legislation related to the Migratory Bird Treaty Act “hatred”? Good to know politicians’ stance on conservation issues. Oh, there goes the hatred accusations again, anytime someone brings up keeping protections for migratory bird species. Got any better arguments? Why do you bring up cats? Is yours outdoors instead of responsibly indoors? Or are you now going to start on the whole you must hate outdoor cats thing? Just exactly what do you have against protections for migratory bird species? Your comment didn’t make it clear exactly. When Romney brought up MBTA enforcement in a debate, I figured it was only a matter of time before the MBTA’s repeal became a mainstream Republican position. @John: Somehow I missed Romney doing that. It’s insane how willing Republicans are to gut any and all environmental protections. Thanks Corey.. typically Republican agenda. So sad. Thank you Corey for bringing this to the birding communities attention. This is important and I trust there will be no veto proof majority. In addition to the MBTA the republicans are at war with the ESA as well..I wonder what conservatives are trying to conserve other than corporate privileged for the people that bribe them. Contact your senators and make sure they are aware and will work to strip this language. Though, odds are, this is going nowhere, as pretty much everything this ridiculous Republican Congress is doing can’t get through the Senate or will be vetoed if it does. Ironic. The all wonderful democrats allow the murder of innocent unborn babies, and you get upset because a bird might not be protected? Why not try protecting the people first, and then the birds. As a person you can’t justify voting Democrat. This might be my favorite troll comment ever. That was seriously extra troll. I love how Conservatives are anti-Big Government unless they are talking about restricting what women can do with their own bodies. Admirable trolling, Henry A. The kind of bottom of the barrel dregs you have to put up with skulking on the internet eh Corey?? Hey Henry A. go take a dip in the gene pool and read a book willya?? Bet you never thought that you would be able to add Brian and Henry A. to your life list, did you? Imagine, TWO sh$t eating birds in just two days! I’m impressed. @Corey – Glad you liked it! Isn’t it great how every time someone in the comments disagrees with you they are automatically dubbed a troll? FYI I have been visiting this site for years. But if my opinion makes me a troll, then it is a title I will bear with pride. @Cliff Hawley-Killing a baby or killing a bird? No contest! Save the birds! @Kirk- And it isn’t bottom of the barrel to tell someone to ‘take a dip in the gene pool’ simply because they disagree with your point of view? @ Karl Schintone- Be careful! Your insecurities are showing! It is rather immature to start calling such names because of a differing point of view. If my disagreeing with you makes me a *&#$&#@, then would you like to know what you disagreeing with me makes you? Actually, it makes you someone who disagrees with me. Nothing more and nothing less. Why? Because I can accept the fact that people, such as yourself, will disagree with me. It doesn’t really bother me that much. Have a wonderful day! Ah! Delightful! Another clever troll reference!